In 1965, Fred Reich, experienced in the tool and die world, and his wife Judy, formed Reich Tool and Design. 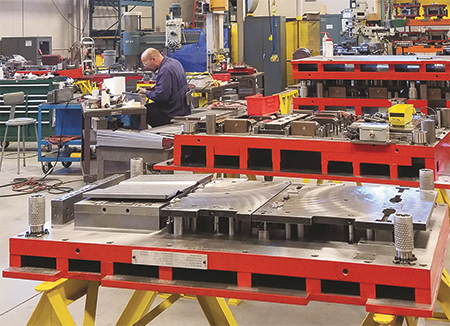 Back then, minding the tooling for OEM stamping customers—there was no shortage of them in and around Milwaukee, WI—seemed like a long-term winning proposition. In its small shop, the company built, maintained and repaired progressive, hand-transfer and regular transfer dies. The first foray outside of its core business occurred after only a few years in business, when a medical customer asked Reich to machine a few parts, using Reich Tool’s existing equipment. That began the company’s contract-machining business. 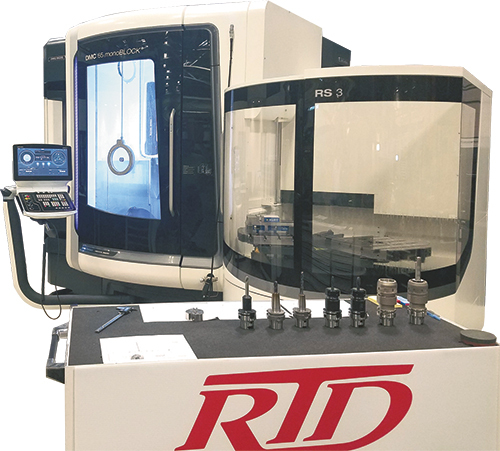 Showcased on Reich Tool & Design’s shop floor is a new five-axis machining center, with its cell turned into a display area to showcase the unit’s capabilities and the company’s commitment to new machining technology. The new machine features a three-station, auto-pallet tool changer that can accommodate 90 tools. Fast forward to the mid-2000s, when some of Reich Tool’s aerospace and medical customers began to inquire as to the company’s assembly capabilities. Fresh into a new 52,000-sq.-ft. headquarters building in Menomonee Falls, WI, Reich Tool decided to go all in on high-value assembly, forming a new company called Trinity Biomedical and expanding its customer base. Whereas at one time 80 percent of company’s business derived from automotive, today that number is closer to 5 percent, replaced by medical, aerospace, appliance, electrical (especially in LED lighting) and others. Branching out into contract machining and high-value assembly was a natural progression for Reich Tool, according to Fritz Reich, president, who led MetalForming on a company tour along with his brother Brett, who runs Reich Tool’s machining operations, and sales and marketing manager Mike San Filippo. It was the precision machining of medical parts that led directly to Reich Tool’s expansion into higher-level assemblies and the formation of Trinity Biomedical, as the medical machining customers began asking Reich Tool to produce intricate assemblies by adding nonmetal components or performing all-metal assemblies, according to Fritz. Reich Tool, with its stable of high-tech equipment and expertise in die build and repair, has leveraged all of it to successfully build its precision contract-machining business, producing parts such as these for aerospace, medical and other customers. To meet strict cleanliness standards demanded by medical customers for their assemblies, in 2008 Reich Tool built a 2500-sq.-ft. Class 10,000 cleanroom to house the newly formed Trinity Biomedical. Also added: an ultrasonic wash line, primarily for cleaning stainless-steel and titanium parts. “Then we just kept growing the business,” says Fritz. Today, Trinity Biomedical mainly contracts manufacturing and assembly of products to support the medical-device industry. These include respiration and ventilation products, a combination of metallic and plastic parts assembled into chest tubes and similar items, as well as orthopedic-related assemblies used in surgical applications. The company also performs contract washing for local stampers that require specific particulate levels on their components. In addition, the cleanroom houses laser-marking and packaging capability. Should expansion be necessary, Reich Tool’s grinding room is set up with pressure and ventilation control infrastructure for simplified conversion into a cleanroom, with a new grinding room built to maintain current capabilities. As impressive as Trinity Biomedical’s facilities, equipment and capabilities are, its parent company takes no backseat. With 60 employees, including five with Trinity Biomedical, Reich Tool, is fully stocked to perform die build and repair, contract machining and assembly. Three mechanical tryout presses, the largest with a capacity of 400 tons, trial progressive and transfer tooling. For larger dies—Reich Tool recently built its largest yet, a 50,000-lb. monster stretching past 200 in.—the company performs tryout on bigger presses at an area stamper. Over the past decade, Reich Tool’s ability to build large dies has acted as a hedge against overseas competition, owing to the costs and logistics challenges in shipping the large, heavy work across oceans. In the mid-1980s, Reich Tool set out on modernizing its stable of machining equipment, bringing in its first wire-EDM machine and first programming computer. Today, the operation features several wire-EDMs, CNC vertical-machining and turning equipment, bar feeders, a waterjet cutter and gas-metal-arc and gas-tungsten-arc welding capabilities. Feeding the company’s equipment is just about any type of material, from various steels including stainless to aluminum and titanium alloys, and other exotic alloys often found in aerospace and medical applications. Showcased on the shop floor is a new five-axis DMC 65 MonoBlock machining center from DMG/Mori. Reich Tool turned the cell into a display area to showcase the unit’s capabilities and the company’s commitment to new machining technology. The machine features a three-station, auto-pallet tool changer and can accommodate 90 tools. “This machine is designed to do 3D work in a production setting, in high volume or as one-offs,” says Brett Reich. High-speed machining at Reich Tool reaches 20,000 rpm, thanks in part to inclusion of through-the-tool coolant circulation to keep temperatures low. The company also has added Swiss-type turning capability, allowing for detailed turning, threading, drilling, tapping and countersinking on components with diameters of less than 1 in. —a nod to Reich Tool’s precision-machining expertise. But precision work does not necessarily mean small work. “Our equipment and work tables are large enough to construct die sets in a single setup,” says Brett. 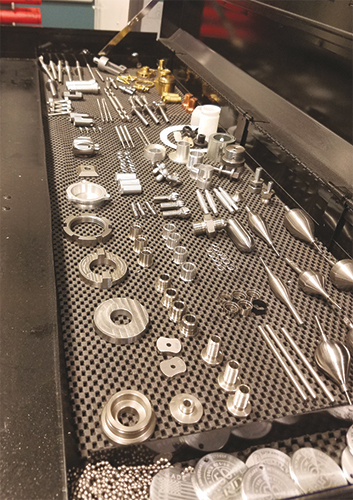 Reich Tool & Design, encompassing stamping-tool design build and repair operations, a contract-machining division and Trinity Biomedical’s cleanroom assembly operation, has occasionally seen work cross all three of these units to achieve a final product. A module used to create fields for CT scanners is one such example. For each module, the tooling area flattens and cuts 232 fins made from 0.007-in.-thick type 302/304 full-hard stainless steel, which are further processed via wire-EDM work in the machining division. 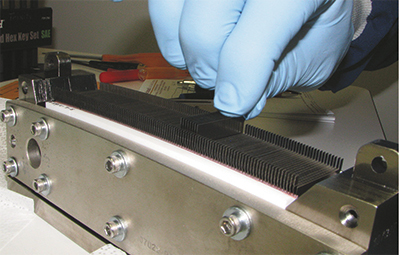 Machineable ceramic forms a base to hold the fins via precisely cut and spaced slots in the ceramic—spacing is critical to ensure creation of the correct electrical field. The fins are glued into the slots, with microwelding employed to attach wire leads. Swiss turning is another machining step, used to create inserts that also are placed into the module. Many of the assembly operations, including washing of the fins and entire module, take place in Trinity Biomedical’s cleanroom. Wire leads then connect the modules to form a complete donut ring as the final assembly step, an operation also performed in the cleanroom. Without all of these capabilities inhouse, Reich Tool may have never received this contract, according Fritz Reich, president. Over the past decade, the ability to build large dies acted as a hedge against overseas competition for Reich Tool, owing to the costs and logistics challenges in shipping the large, heavy work across oceans. Going big to battle overseas competition was just one way the company has sought to remain a stable employer for its workforce. In fact, employment stability was a major factor in diversifying into contract machining and assembly. Reich Tool also cross-trains employees, enabling proper staffing across the various operations and business units and allowing employees in slow-down operations to work in other areas of the company. It all fits with Reich Tool’s family culture, says Fritz, noting that supervisors put on cookouts throughout the summer and employees band together to support numerous local charities. In addition, Reich Tool supports the local high school’s robotics team and works closely with local tech schools. The company has, at any one time, seven or eight apprentices, and often they end up as full-time employees.